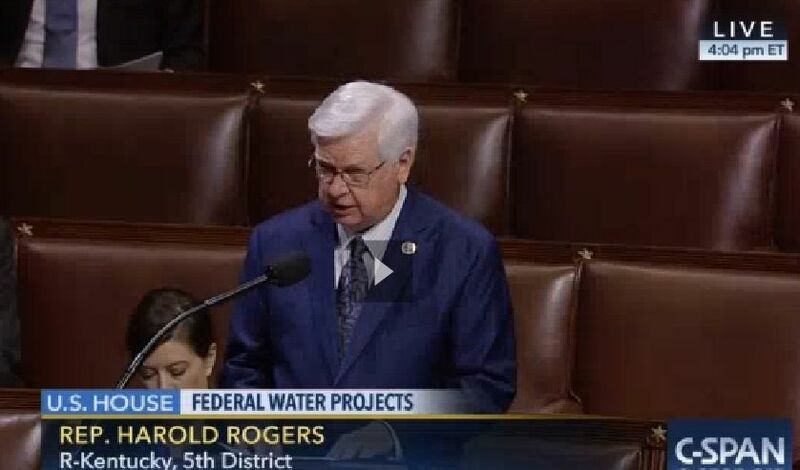 U.S. Rep. Harold "Hal" Rogers (KY-05) applauds the U.S. House of Representatives for passing the Water Resources Development Act of 2016 (H.R. 5303). It provides strong congressional oversight of the U.S. Army Corps of Engineers and authorizes activities over a two year cycle for responsible flood protection, water resources development and other critical programs. The legislation includes Rogers' amendment to approve "floating cabins" on lakes operated by the Corps in the Cumberland River basin, like Lake Cumberland in southern Kentucky. Rogers offered the following remarks about his amendment on the floor of the U.S. House of Representatives encouraging support from his colleagues. "Thank you, Mr. Speaker and thank you, Mr. Chairman, for the opportunity to offer this amendment. This small legislative clarification will go a long way to promote tourism and economic opportunity on Corps lakes. "Beautiful Lake Cumberland in my congressional district is the largest man-made lake east of the Mississippi. Located within a day’s drive of 87 million Americans and with over 1,200 miles of pristine coastline, it’s the ideal location for families to enjoy a week or a weekend on a houseboat. Indeed – Lake Cumberland was once the houseboat capital of America, but that all abruptly changed when a major Corps rehabilitation project coincided with the downturn of the U.S. economy in 2007. The Corps had to lower the lake by some 43 feet to repair damage to Wolf Creek Dam, and the houseboat business was all but decimated. "It took 7 years to complete this project and restore lake levels, but I am proud to say that Lake Cumberland is open for business! Unfortunately, the Corps has not been as eager as others to bring back the vibrant houseboat industry that once flourished in this region, or to support the emerging floating cabin industry that promises to make lake life accessible to more and more vacationers. "With Chairman Shuster’s support, we added bipartisan language to the last WRDA bill to ensure that floating cabins – once garnering safety approval by the U.S. Coast Guard – would be permitted on Corps lakes. However, the Corps has since found new and creative ways to continue banning floating cabins from their lakes – particularly through the promulgation of overly burdensome guidance with requirements far more stringent than those health and safety standards expected by the Coast Guard. "The Coast Guard has successfully safeguarded our maritime system since its creation in 1790, and it is therefore the Coast Guard that should be the lead federal agency in regulating the vessels that navigate our federal waterways. Today’s amendment simply reinforces congressional intent to ensure that there is ONE standard for these floating cabins, and that is the standard set by the U.S. Coast Guard. Safety should always remain our highest priority, and I am confident these cabins will create exciting new opportunities at Lake Cumberland and other Corps lakes. I urge you all to support this amendment, and I yield back." The U.S. Senate recently passed similar legislation.